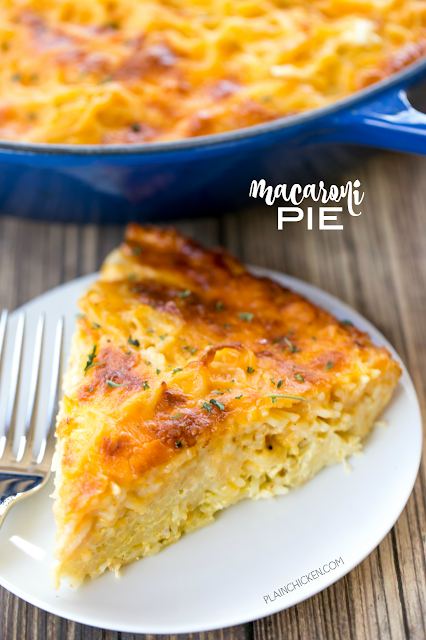 Macaroni Pie - THE BEST mac and cheese EVER. My husband took one bite and couldn't stop raving about it! Vermicelli, eggs, milk, dry mustard, cayenne pepper and cheddar cheese. Seriously amazing! Can add ham or chicken to make this a main dish. Easy to half too. Everyone LOVED this easy casserole! 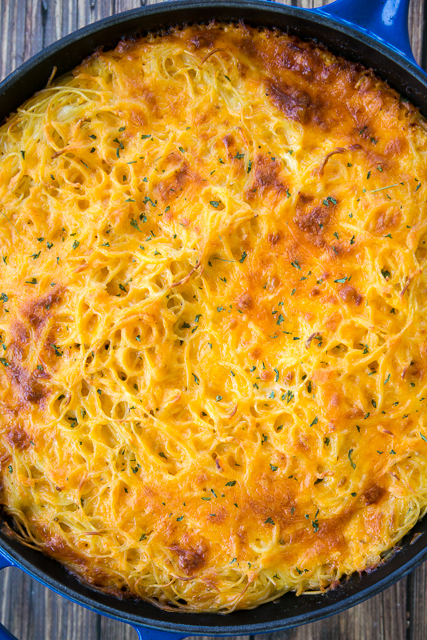 Stop what you are doing and make this Macaroni Pie ASAP. This is hands-down THE BEST mac & cheese EVER. It is made with thin spaghetti instead of elbow macaroni and has tons and tons of ooey, gooey cheese. Chicken Legs could not stop raving about this dish! He has requested that we only serve this mac & cheese from now on. We served this as a side dish, but you could add some ham or chicken to the pasta and make this a main dish. This makes a TON of cheesy pasta. You could easily half the recipe if you don't need to feed a crowd. I baked this in a 12-inch cast iron skillet. If you don't have a large cast iron skillet, you could use a 9x13-inch pan. Preheat oven to 375ºF. Lightly spray a 12-inch cast iron pan or 9x13-inch pan with cooking spray. Set aside. Whisk together eggs, milk, dry mustard and cayenne pepper in a large bowl. Add the pasta and 4 cups of the cheddar cheese. Mix well. Transfer pasta to prepared pan. Top with remaining cheese. Bake uncovered for 45 minutes, until golden brown and bubbly. Just a quick question...does it matter if the cheese is freshly shredded or store bought shredded? Sometimes the preshredded cheese makes mac & cheese clumpy. I used pre shredded cheese from Costco and it was fine. Fresh grated is always better, but I think the pre shredded should be fine. This looks so good, Stephanie. Do you breakup the spaghetti noodles in half, or cook them long? I cooked the noodles long, but broken would be fine too. This was a big hit with the mac & cheese fans at my house. I made 1/2 batch in a 9" skillet, using elbow macaroni (because I didn't want to listen to the 15 year old debate that it shouldn't be called macaroni pie if it had spaghetti). I baked it for 35 minutes - next time, I'll check it a few minutes earlier. There will definitely be a next time.